Other accounting services market comprises establishments (except offices of CPAs) engaged in providing accounting services (except tax return preparation services only or payroll services only). These establishments may also provide tax return preparation or payroll services. Accountant (except CPA) offices, bookkeeper offices, and billing offices are included in this market. 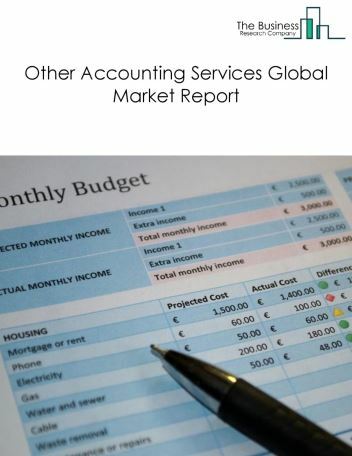 The global other accounting services market was valued at $35.5 billion in 2017. North America was the largest geographic region accounting for $14.97 billion or 42.2% of the global market. The USA was the largest country accounting for $12.2 billion or 34.3% of the global other accounting services market. Technology is driving collaboration between accountants and clients in the accounting services market. It is being driven by portals, tools and technology that promote simple flow of information between accountants and businesses. New communication technologies are replacing traditional communication platforms such as email. For instance, chat platforms like Slack, HipChat and Basecamp are speeding up communications and enabling real time interactions. The companies covered are Delloite, PwC, Ernst & Young, KPMG, and BDO.